Monaco (France) April 17 (IANS) Serbia s Novak Djokovic earned his first Masters 1 000 win this year after defeating fellow Serbian Dusan Lajovic 6-0 6-1 in the first round of the Rolex Monte-Carlo Masters. World No.13 Djokovic needed just 56 minutes to beat his rival and concluded the Monday night s match without giving up a single break point of the four his opponent had reports EFE news agency. The 30-year-old Serbian ninth-seed competes at the Monte-Carlo Masters for the 12th time after claiming the title in 2013 and 2015. 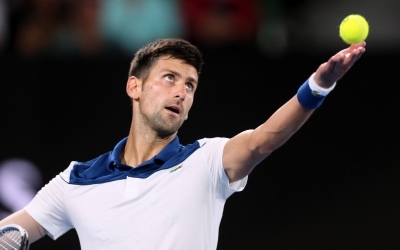 Djokovic who reunited with coach Marian Vajda is set to play the next round against Indian Wells semi-finalist Borna Coric of Croatia who defeated Frenchman Julien Benneteau 6-2 6-3 on Monday. If Djokovic a former world No.1 wins his upcoming matches he may face current world No.1 Rafael Nadal in the quarter-finals.